Something was certainly in the air during the week the Jukes returned to Central Europe – and I don’t just mean the heady aroma of the Dutch Weed that seems to appear as if by magic, encircling you like Harry Potter‟s cloak of invisibility the minute you enter the Amsterdam city limits. No, this “something” was even more powerful than that. The week began with the tragic news about soul legend, Solomon Burke, who passed away en route to the very venue where the Jukes were scheduled to appear. That was followed by the equally sad news that Jeff Kazee had suffered a sudden, close family bereavement that understandably prevented him from taking part in the first half of the tour. Hmmm… a Jukes line up without Jeff?? Well, as Confucius he say: He who conquers himself is the mightiest warrior (or words to that effect)… and despite the obvious challenges, the show did go on! It’s been a couple of years since I last visited Amsterdam’s famous Paradiso Club, which, if you’ve never been there, actually began its life in the eighteen-somethings as a place of religious worship. If you can imagine the inside of a church that has ceilings high enough to accommodate two balcony levels that have a direct view over the stage, which in turn is set against a background of three large (illuminated) windows, you’ll have an idea of the interior of a long-time favourite venue of the Jukes and fans alike – as per the thronging international mass who braved the pouring rain while waiting in line to secure their place as close to the centre mic as possible. The stage was set under the watchful expertise of Hood… the sound-check was completed under the watchful expertise of Joe Prinzo… the Hammond was significant by its absence… and suddenly, the calm before the storm came to an abrupt end as The Reverend Peyton’s Big Damn Band hit the stage… running! Not to be confused with another BIG Band that we all know and love, this was a 3-piece ensemble consisting of guitar – several actually, one of which was made from a Dominican Republican cigar box – drums and… a washboard, strapped on in the same way that one would associate with, perhaps… a Telecaster. Let’s just say that the performance was certainly full of passion and enthusiasm possibly due to a build-up of pent up energy from the fact that these guys had to put their European spring tour on the back burner because of the Icelandic volcanic ash problem. The Big Damn Band’s set was a little on the Cotton-Eye-Joe-skiffle-side-of-blue-grass-rock, and I for one wouldn‟t have argued with the lady on the washboard whose finale was to set her instrument on fire – if this was indeed a statement of feminism, I think we should be grateful for the fact that Breezy Peyton chose this approach as opposed to actually burning her bra! So yes… patience is a virtue – or so they say – and finally, like a (much needed) breath of fresh air… Harder Than It Looks, the opening song from the new album, Pills and Ammo, exploded from the sound system and real life went on hold… at least for the next couple of hours. In spite of being Hammond-less, Southside Johnny and the Asbury Jukes seemed to dig just that little bit deeper and improvised their way through the set in a very business-as-usual way. Intros were quickly rearranged, gaps were filled and the results were everything one has come to expect from the Greatest Bar Band in the World. At one point Johnny leaned against the mic stand and lamented: “… everything is broken tonight… my mic is broken… Jeff is broken…” But nevertheless, the guys seemed to find that extra oooooooomph reserve and the show was simply fabulous. The line up for both nights was a little bit like seeing the Jukes past, present and future all at once. Additions to the Jukes’ Family Tree for me were Billy Walton and Skip Ward and it was a real pleasure to have seen/heard them play – I loved the red/orange curly-wurly guitar lead, Skip… very retro! Also, once or twice during the show I “thought” I saw Billy Walton performing some impromptu flick and catch routines with his guitar pick… let’s just say that Billy‟s reactions are unbelievably fast and I’m happy to say that my eyesight is better than I thought it was – rock on, Billy the King of the Guitar Pick Flick! Rather than talk about each song, I’ve listed the set at the bottom and anyone who is in any way familiar with the Jukes and their music will see what a great show it was…. full of surprises, like the tribute to Solomon Burke, for example and of course, all the interaction which is part and parcel of any Jukes’ concert like Johnny taking pictures with fans’ cameras and hugging friends in the front row. The Jukes sure rocked the joint – as in Paradiso, that is – and, looking round, it was great to see the usual suspects… Klaus and Gundula, Marijan and Evelien, Glasgow John, René, Jos and Muriel aaaand… the Souls On Fire guys who had travelled a long, long way from the south of Germany especially for the show – great to see you again guys! All too soon, the spell was broken as the house lights came on signalling the end of yet another amazing Amsterdam party and off we went, out into the night, happy to have been there and picking up the real life we left behind a couple of hours before. 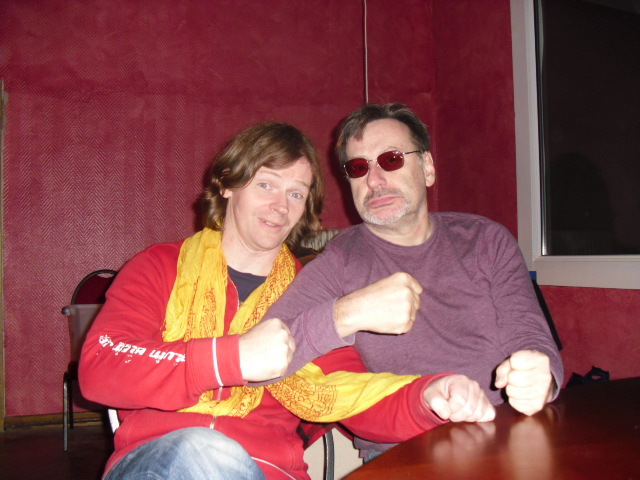 By road, it’s about 3 hours – give or take – from Amsterdam to Melle… and when I arrived, the sound-check was already underway which reminds me… Graham Swinnerton, as in: he-who-drives-the-Jukes-around-Europe-in-the-blue-van, swapped his car keys for a parachute at the beginning of September… yes, a parachute! Graham actually jumped out of a plane and did a tandem parachute jump in aid of a children‟s hospice that is particularly close to his heart. Congratulations on a safe and successful landing… Graham, you rock! In complete contrast to the opening act in Amsterdam, tonight‟s performer was singer/songwriter, Martin Praetorius, whose name might be familiar to those who have been following Joe Gruschecky and the Houserocker’s career. 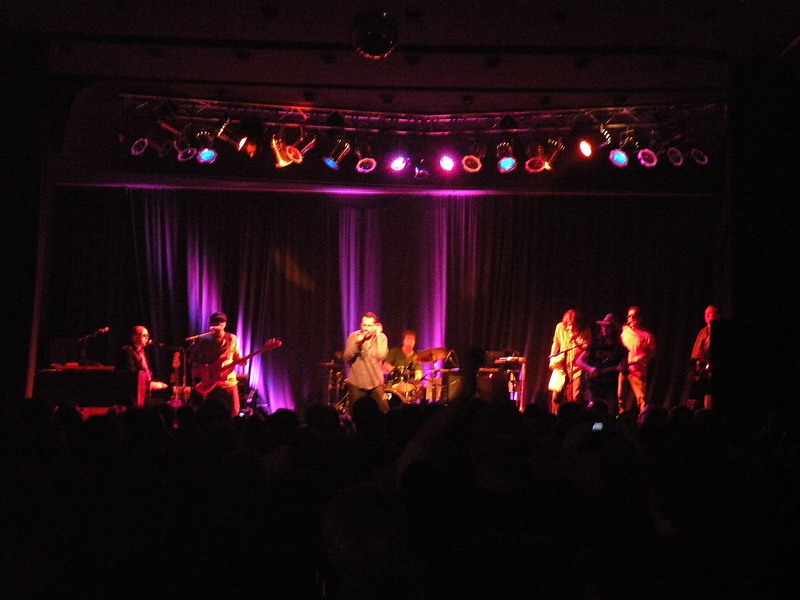 Back in the 90s, Martin’s band, “Scooter and the Streethearts” accompanied the Houserockers on their European tour, which, of course, was managed by Bob Benjamin. Martin also opened the very first German “Light of Day” show which was another magical night last December in Melle. 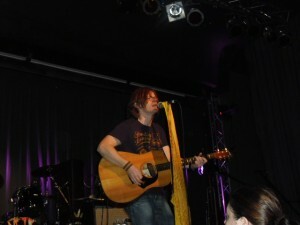 During his solo acoustic set, Martin presented a selection of original songs from a new album that is teetering on the brink of being released. His version of Springsteen’s, No Surrender, brought his set to an all-too-short close resulting in a well-deserved, rapturous response from the Melle crowd. “Pound for pound, round for round, there is no better sound around than… Southside Johnny and the Asbury Jukes”, announced Reiner Borgmeyer, long-time Jukes fan and nephew of the event organiser, Volker König, as he introduced the band, signalling the start of what turned out to be another great show. The opening song and Jukes’ classic, Talk to Me, set the pace for this gig and as you can see from the set lists, both nights very much had their own identity. It’s always great to see the band having fun on stage and everyone seemed to be having a really great time. All the trade mark solos were there… Johnny’s harp… Ed’s sensational sax… Johnny’s oh-so-soulful deliveries… Joey’s sax on “Renee” (which always touches the spot with me)… Johnny’s interaction with the crowd… Chris’ trumpet solos and aerobic routines are always pure joy to listen to/watch… Johnny’s narratives … Neil’s skilful trombone antics… Johnny’s photography skills… Billy’s guitar pick flick routines… Glenn’s nifty fret board expertise … and of course, the mighty rhythm section talents of Tom and Skip. I think my favourite moment of the show was when my ears picked up the intro to Tired Skin and just as Chris was getting ready to perform, Johnny went off in another direction and started to sing, Into the Harbour. Needless to say, this resulted in muchos hilarity all round! In contrast to Amsterdam, the worst thing that seemed to be “broken” was one of Billy’s guitar strings – apart from the missing Hammond, that is. Or, at least, that’s what we all thought. According to local newspaper reports, it looks like the business future of the Ballsaal as a venue in Melle is in serious doubt in which case I guess we can but hope for bigger and better things if this particular door does close. So yes, as the last notes of One More Night to Rock faded, and the crowd yelled for even more, it’s possible that we saw the Jukes leave this particular stage for the last time as they packed up and got ready to rumble for the rest of the tour. As always, it is such a treat to see the band here… thank you so much Bill as well as to everyone concerned for making this possible and let’s raise a glass to the next time, wherever it is.